There are times in our lives when storms of life assail us. Storms come and storms go. We can go through them and come out the other side. Both this page and the page "Thank God for the storm" link together. I am talking about storms—one of which could be your storm—one you might be in right now! Your present storm will pass. Jesus has a purpose or is working towards a plan. We might not always see it clearly of course which is why we need to learn to trust Him, recognize His voice, know His word and cultivate a deep personal relationship with Him. Imagine a married couple never getting to know each other properly in all respects. When I make a coffee for example, I do not ask my wife if she wants milk because I know she does and I do not put sugar in her cup because I know she does not take sugar. I know this by close, regular, intimate association and communication. Do you know what the Lord likes or dislikes? It’s all in the bible. There are definite things that He abhors and He has written them down. I’m not going to tell you...find out for yourselves! In this story, we shall see that Jesus was, as usual (sometimes the bible says “as was His custom”), working to a pre-determined, specific plan. I’ll tell you about this particular one. When we read certain stories in the bible we sometimes forget that they are often a series of interwoven events. It is like sharing your testimony, such as, “We were doing this and then such-and-such happened.” The book of Acts is a prime example and the Gospel narrations are often like that too. I will refer to Mark chapter four today as such a series of events. Our core text is Mark 4:35-41, but it really starts well before that. In verse one, Mark states that Jesus started teaching...Again! Teaching is a very important part of His ministry and should be a very important part of ours also. You’ve got to have something to teach however. It is all very well in hyping people and ourselves up with positive faith affirmations and getting them to say the sinners prayer, get them saved and think we are doing great, but Jesus told us to make disciples! People can get all excited and jump and yell in a service, but behave totally different elsewhere. Our tasks should include the various aspects of evangelism, but we pastors in particular Must do more than hold church and have programs, no matter how good they may be. We really do not need props, because the word of God itself is the liberating, life-changing force. Present the truth and the truth itself is what makes people free. Jesus was about to set a key player free as we shall soon see. The early parts of Mark 4 are often misunderstood, with the focus on the kinds of people who hear the message and what they do with it. It often focuses on the kinds of soil in which the seed is planted. Much ado is made of all of the parables and Jesus clearly said that if we can understand this particular story, we can get a handle them all! Jesus also said that we should be careful in how we hear and act on what we hear as well as what we hear. 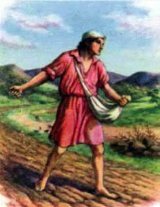 He clearly stated that the sower sows the word (verse 14). The seed is the word! When the Lord tells me, to whom to sow, how to sow it and when to sow it, we do! If we do not adhere to such principles we might as well burn our money, because there will be no harvest. I also do not ask for money! Be careful of people who keep doing that. Let the Lord inspire giving. The Lord then revealed all there was to reveal to His disciples and to those who were joining themselves to Him and His group. He didn’t hide anything. Things are hidden For us and not From us! They are revealed only to those who are in close intimacy with Him. OK. That’’s the preamble. It all leads straight into our core message. Did you notice that it was the same day? He had been in teaching mode and had an unfinished assignment, quite likely teaching more in the process. It was evening time. Most people are thinking of the evening meal, but His bread was to do the will of the Father. Most people are thinking of sleep and rest, but He was already in His rest. Sleeping came later. He had a plan or an objective and it was to open a branch of The Jesus of Nazareth Evangelistic Association over there. He had a special appointment to keep with the man he had chosen to represent Him in that part of the world. What I am going to do now is break this down because what happens is very important. Let us look at it again, this time in the authorized version. That word for day is Hēmera. It is the space of time between dawn and dusk of course, but one meaning means Tame or Gentle! Jesus was sending them over during the tame and gentle part of the evening. There was no indication whatever of a storm coming. One of the southern hemisphere's most powerful cyclones on record, a category 5 cyclone (or hurricane) named Winston created havoc and left a trail of destruction behind it, including numerous fatalities, this last weekend as I write. We are fortunate today to have technology to warn us of impending danger, but there was none that day when Jesus told them that they were going over to the other side of the sea in ships. I said, “Ships”...plural. That means there were other boats accompanying Him. Let us backtrack a little. Mark said that Jesus had been teaching the multitude. He was talking to Them...the multitude in parables. In verse 10, Mark said that when Jesus was alone They (not the multitude) that were with Him and the disciples asked Him for understanding. Jesus then spoke to Them (the disciples and those with them) in verse 10 and in verse 34. All this is another story best shared at different time. It was after that, when Jesus told Them let Us pass over the other side. This implies that Jesus, the twelve And those others were going sailing that evening! The Them and Us principle again. Have you seen it yet? They sent Them (the multitude home, but They (the disciples and those others) got into a ship with Him. They also got into other little ships. This is important because we tend to thing there was only one boat there, but there was a little fleet and you will see something extraordinary soon. The phrase took Him as He was talks about deliberately choosing to be in close association with Him. More on that later. I am laying a foundation here. When He said, “Let Us pass over to the other side”, He clearly intended to get there and He wanted them all to be there with Him. If He tells you that He wants you somewhere, He intends you to get there and no demon from hell can stop it. The only things that can stop it are unbelief and disobedience. Lack of money is an excuse. Lack of opportunity is a copout. You are debating the issue with the one who has the Keys of David; the one who opened the Red Sea; the one who fed a few million souls for 40 years in the wilderness and the one who fed 5000 hungry men with a small boy’s picnic lunch. Things don’t work when we get out of step. When we moved to South Australia, we had wanted to do that for what seems like a hundred years and knew that God wanted it. I had all the confirmations under the sun; all the prophecies and all the Rhema words, but we had not moved! One day the Lord got onto our case and told us that if we did not do what He had asked us, when He asked us, we would remain there forever and go no further. We kept telling Him that we wanted to go and that the only thing holding us back was money. We said that as soon as He gave us the money, we would go, but He thinks differently to us. He told when you commit to, the finances will be there. Once we took the step to go, the funds arrived. We were a little like Peter then and got out of our own boat or personal comfort zone. It was not easy—but we are here and doing what He wants! Some of you are still where you were years ago and may remain there until the end of the age if you do not do what He has told you. Some people put things off too long that when they finally decide to cooperate with the Lord, it is too late. The boarding call has finished. The aircraft has taken off. The ship has disappeared over the horizon. Sometimes the excuses we make are just that—excuses and they don’t hold water. Don’t be foolish. Do not step out and hope things will happen unless He tells you. Go when He says so, but do not presume and try to make things happen. Peter stepped out of the boat in our last message only when Jesus said, “Come”. I’ve said thus before too, but many people have a heart for God and attempt things that He never asked them to do and things do not work out for them. Bless their hearts. I’ve seen many hurt and disillusioned believers trying to do things for God, rather than going with the flow and letting Him do it. Work together. Jesus told those people, “Let Us go over to the other side”. He meant a literal departure, leaving one place to arrive at a pre-determined destination. The meaning of this phrase is Dierchomai and it means all those things...plus something intriguing. One meaning is to pierce. They were going to a dark place. It was as if they were going into enemy territory. Light was about to pierce the darkness. Light always dispels darkness. Try it. Wait until midnight on a moonless night, step outside and strike a match and see if I am correct. This is one of several reasons why we cannot have one foot in each camp. We cannot have light and dark inside simultaneously. We cannot have sweet water and salt water in our well at the same time and expect the anointing to manifest and the blessing of God to come. Look next at the phrase, “They took Him”. The Greek word is Paralambanō. It is a powerful “action” word. It talks about deliberately associating oneself with Him, to learn, to assume an office and to take. They didn’t want to just go to church from time to time and be mere spectators, but to be a real part of the action and be up there standing right beside the Lord in this thing. They wanted to get into the same boat He was in. Friends, the anointing can “rub off’ onto others. Hang out with believers who really have their acts together, are not playing church games and know the ways of God. In my early days, I knew nothing. None of us really knew much then, but I saw things in the bible and wanted them! I saw how God moved with certain people and wanted that too, even though I did not understand much. If God said it, it had to be true and it takes a good theologian to mess things around, so I asked Him to reveal truth, which He did. I met people like Kenneth Hagin, John Osteen and Oral Roberts (all now home with the Lord) and was fortunate to minister with Kenneth Hagin. Some of his anointing rubbed off onto me. I watched Kathryn Kuhlman and longed to meet her but didn’t, but one person who did is Benny Hinn. I’ve met him and spoken with him and been on his platform. Some of that anointing is now on me too! You may think I am bragging. Yes I am! But I am bragging on the Lord and those men had a hunger for the Lord that led them to do unusual things. Would you tear up someone’s roof to get your friend to a meeting? 4 men did. Would you push through a seething mob to touch Jesus’ garments? One woman did. Would you climb up into a tree just to catch a glimpse of Jesus walking down the road? One man did and grabbed Jesus’ attention so much, He invited himself to the man’s home for lunch. Would you sit in a dusty street and keep yelling out out for Jesus to have mercy on you whilst everyone else tried to kick you out of the way and tell you to shut up? One man did and Jesus healed him (no one else). It seems that we must sometimes get a little radical the right way and those people got radical and wanted to get into any boat so that they could go where Jesus was going. So here we are. A little motley fleet of enthusiasts going with Jesus to...what...where? All He told them was that they were going over to the other side. They didn’t care. As long as they were all together, that was their issue. The bible does not say how many boats there were, only that other little ships accompanied him. Apparently His ship was a little larger than theirs. They were now on their way when a great whirlwind or squall suddenly came as if out of nowhere. Some storms there are not unknown, but this one was something else. A category 5 cyclone takes days to develop and slowly move, but this storm was whipped up in minutes—in the middle of the evening. How? What was it? Where did it come from? The bible calls it Ginomai. There are many English meanings like fall or falling; rise, risen or rouse. Think of the rousing that happens when disturbing an angry watchdog or waving a red flag at a bull. Other words mean generate, follow, follow after or pursue. They all seem to be action words of come kind. Something triggered it! It is described as a storm of wind (Anemos) that is often associated with something or someone blowing. I hope you see a picture forming. Something was blowing on the waves in such a way that it was agitating and stirring up the water until unnatural waves were formed. Those waves started to beat into the ship, not against or over it. Waves often hit ships and break over them, but these waves beat into the ship. The Greek word is Epiballō that is a compound word taken from Epi and Ballō—so it is a very forceful and powerful word. The best way to describe it is like this. Imagine someone scooping up something in your hand and forcibly hurling it straight against a target. In this case, think of something or someone scooping up a huge fistful of water and throwing it right at them; them another; and another and another. One no sooner hit them when, “bam” another struck and beat Into The ship. Notice it states The ship. This was where Jesus was. What about the other little ships accompanying Him? His ship was the target. Jesus and the disciples were in That boat! You can forget the others. They were not on a specific assignment. It seem that something was deliberately targeting Jesus to take Him out and those others who were also becoming a threat to the source of the problem! You guessed it! 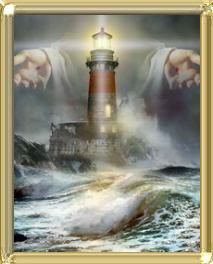 This was a spiritual force causing that storm and the aim was to thwart the plan of God. Have you ever wondered why you embark on something that God has initiated (that is the deciding factor) and seem to attract fierce, sudden opposition? OK...the devil is a bad guy all the time and he delights in causing trouble and inflicting problems, but when you start to get serious, start obeying God, start talking words of faith, he seems to want to steal your joy, plant weeds amongst your seed and disrupt things. He tries to discourage you, use other people to annoy you or let you down and does his best worst to distract you. You just might be doing something right! Look; if no one else threatens you, says nasty things about you or touches your property, you just don’t bother, but watch out if someone starts rocking the boat...then...you get stirred up! You might know of the phrase let sleeping dogs lie. Well think of it like this. The devil does not give a hoot if you go to church. He does not care if you read a bible. He does not care if you even pray. Religious folk do all that. What stirs him up is the fact that you start to change, or wake up and start applying the things of God and putting them to work. You can go “shundai” all you like; play “Christian music” all day long or even watch ministry DVD’s all day and he will not necessarily get stirred up, but once you get serious and start applying those things, you could be stepping onto the turf he thinks is his. He could start thinking that you are becoming a threat to him. Do not fear. Jesus has already won, so join the winning team and continue fighting the good fight of faith. 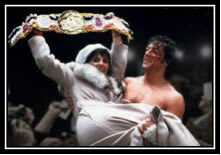 You might get a bloodied nose in the ring like Rocky did in those Rocky movies, (Hey, Adrian! Duh! We dunnit), but it’s not over, ‘till its over and the referee lifts your hand and declares you the winner. We do not win by a points decision but by a TKO. The devil has been KO’d, remember? It’s just a matter of time, till the referee says, “You’re Out!” and that day is fast approaching. The answer is that He was resting in God. I tell you, there is a place by God whereby we can enter into His rest. I did a little word study on that and it is part of our covenant promise. God rested on the 7th day after His labor, not because he got tired from hard work, but because He had competed His task. This does not mean that He has stopped doing things. On the contrary, His “work” is ongoing, but we are now part of it. If His work is already completed, we do not have to stress out, struggle and strive, trying to do things for the Lord, but co-laboring together with Him as the burden bearer. I’m not talking about laziness or such things. I am talking about taking His light and easy yoke that is not burdensome on us. How does this work in everyday modern life? After several weeks of unsuccessful attempts, failures, reverting to old habits, I reached the position whereby I knew that it was now all or nothing. The change was instantaneous. I never touched cigarettes again. The reason was that I had tried to carry a load myself without involving Him. You see, it is an exchange of lives that matters. The bible says that when Jesus died, I died with Him and when God raised Him from the dead, I was raised with Him. I had to learn that I was a dead man. When you are a dead man, things do not affect you! I hope you see this secret. Jesus was dead to everything the world offered Him, but was alive to God. By living on this earth as a dead man, He was able to rest in the provision, protection and stability of the Father’s way of doing things. When those waves smashed into the boat, not one drop fell on Him. This stuff works folks. I’ve proved it many times. So have many other believers who can share testimony after testimony to this effect. As far as He was concerned, He was going to step out of the boat onto the beach on the distant shore, because that was where the Father had sent Him. If God has despatched you on a specific assignment, He can do the same for you. I say it again. It has to be a God assignment and not a man made assignment. Only a few hours beforehand, He had revealed the secrets of the universe to them and only a short while before that healed many sick people and cast out demons. How quickly did they forget, but aren’t we like that too? They had forgotten that He said we are all going over to the other side. I’m bringing this to a head now. Let us first look at something else He said. It is about prayer. Let us go to Mark 11. Here Jesus had cursed the fig tree. How? By speaking to it in passing. He told us to have the God kind of faith. He said “Whosoever”. This means that whosoever can have the God kind of faith. He said that the whosoever’s shall (not might be able) speak to the mountain (whatever your mountain is) and get results. He did not tell us to pray about the mountain. This is where most people fall down. They walk into trouble and start asking God to help them. So we should of course, but there are times when God expects us to deal with it ourselves. The reason is that He has given us the ability and authority to do so. He did not tell us to talk to others about your problems, although there are times we can and should share with others for mutual help and encouragement. You see, the problem is that people turn to God or pray as a last resort. Put Him first. Get His mind on the situation. Get a word about it and then start saying that word! Speak that word to that mountain. Jesus also said not to doubt in our hearts. Doubts are like cancers. Doubts can become words that when spoken become a creative force. Jesus did not tell us to believe. He told us to believe that we receive when we pray. I emphasized the word them, because it does not appear in the original language. Those waves kept pounding into that ship, over and over again until it was full to the brim. Why didn’t it sink? That was the plan. The Greek word is Gemizō that describes the state of being so full, you could not get another drop into it and that it was so full, the boat began to bulge and swell. Jesus was sleeping like a baby in the stern. How could He do that in the middle of all that chaos, howling wind and drenching waves pounding into the ship to fill it to overflowing? Even if the hind part of the boat had a raised platform, anyone there would be drenched. We have to remember that everything Jesus did on the earth was as an ordinary human being. How, oh how, was He able to sleep? Now.......come back to the storm. When they woke Jesus, He stood up in the stern and practiced what He preached. He Spoke! Look at it. The first thing He did was Diegeirō that means a little more than merely waking up from sleep. Some people take a long time to become fully conscious in the mornings. They stumble out of bed as if half drugged or something and stagger to the bathroom, finally emerge into the land of the living and getting intelligence from them is a work of art. Jesus woke up and jumped up, aroused, stirred up and immediately alert. In our modern world we have to be very alert to things. The bible talks about waking up to those who slumber and it is not speaking about physical sleep. Jesus told us of the ten virgins who all missed the boat because every one of them was asleep when the bridegroom arrived. The only person who was “with it” was the watchman. The church is a slumbering giant and a handful of watchmen are staying awake. I hope you see the importance of these things. Jesus immediately knew what was happening and why and immediately sprang into action. He did not have to mutter a yawning. “What’s up?” He stood up and immediately dealt with the cause. It is useless putting bandaid treatment on something without dealing with the thing that caused the problem. One dear lady in my church kept coming up for prayer for severe headaches. She would receive prayer and tell folk she was healed. People gave her attention. Sometime later, she returned with the same problem and the cycle went around and around. I knew something was wrong and asked the Lord about it and He told me to stop praying for her. She was an attention getter; a time waster and her pride was the cause. The Lord told me to tell her to stop it and start using her reading glasses. Her eyesight was the problem. Once she stopped her vanity and started wearing her glasses, the headaches stopped. When He rebuked the wind, Jesus dealt with the cause of the problem first. The word is Epitimaō. It is a straight up rebuke. “Stop that!” It was a censure or admonishment. He forbade it from operating. He gave it little respect or value and it was like He said “Stop that. Behave yourself. Is that all you can do?” It was as if He mocked it. 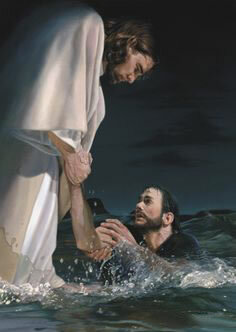 Jesus then said something to the sea or the waves. It was a “Be quiet!” This word for peace in this text is Siōpaō. You or I would probably tell it “Shut up!” He dealt with the cause and then dealt with the effect. He had stopped the wind from doing its stirring and agitation and now told the waves to be still and to be dumb. hold your peace, be silent, settle down. When He then told them to be still, it was an act of muzzling them. Constant yap, yap yap of dogs can be very annoying. Muzzle the things. Jesus muzzled the waves. That word is Phimoō. This is where I got the title for the message. Shhhhh! When Jesus told those waves to behave themselves it was like He said “Shhhh” and a great tranquility immediately fell over the water that became like a sheet of glass. One of the words Mark used to tell us what happened is Kopazō and it means that the wind simply...ceased. Wind often takes a little time to slow down and stop , but this time the wind literally grew tired! It relaxed. It wore itself out. The wind wore itself out so quickly that a great calm came. Mark did not say that it became calm, but a great calm or tranquility came over the storm. If you feel as if you have just had 15 rounds with Cassius Clay, then 15 with Joe Frazier and see Mohammad Ali waiting for you cheer up, you’ve got them on the ropes. Remember that TKO a little while ago? Postage stamp Christians might take a licking, but they reach their destination on the other side and there is a great calm ahead. The Lord had said that He was going over to the other side of that sea and He got there. Mark tells the story of the purpose for that journey in chapter 5 and I will not touch on that now. What I want to do is to tell you that when storms come up as they sometimes do, several things need to be considered. One is that if God has sent you on that journey, He fully intends you to get there. If you are encountering a storm on the way, it could be for a variety of reasons, some of which I have touched on. The devil could be trying to hinder you. In closing, please remember that storms do come and go and do not last forever. If you are in one right now and are doing everything right before God and there is nothing to hinder your progress, get alone with the Lord and ask Him for the solution. Ask Him to reveal a specific word—for you, not what someone else did and then start seeing yourself stepping out of your boat on your distant shore. Speak to that mountain. If it is finances you need, don’t talk to God about them, but talk to them about God. If it is a relationship issue, see that other person in the place where God says He wants him or her (not necessarily where you want them to be) and start talking to that issue, not the person about God. Don’t nag him or her. Pushing can have the reverse effect. Name this person before God in the process. I could continue, but you know what I mean. I know, as I knew last time, that God is talking to specific people. He is on your case. He wants you to make it. He needs you to start telling that storm, “Shhhh”.